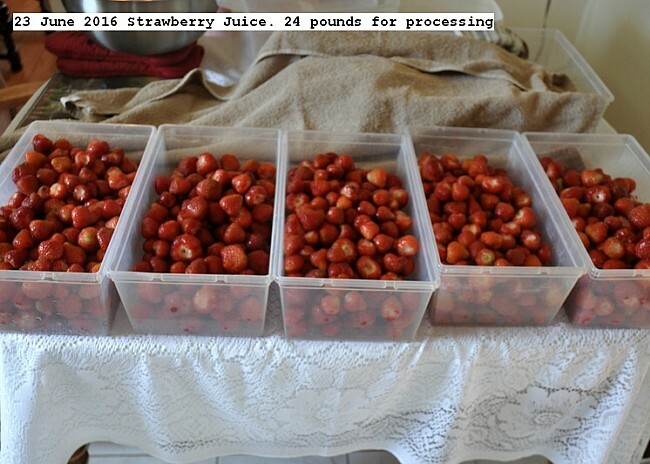 Twenty four quarts\pounds of strawberries were picked at a cost of $2.00 per quart and made into 19 liters of Pressure canned juice. Process was to remove ends, place in cooking pot, cover with water about seven liters, bring to a boil and blend into a slurry. Put through food mill screen 2 mm mesh. There was little residue and this step could be eliminated. The juice was placed in liter jars (19) and pressure canned in batches of seven. The pressure canning was 15 PSI for 15 minutes for long term storage at room temperature. A quart or liter of berries weight about one pound. Each liter of juice contains about 1.2 pounds or a quart/liter of berries. The juice has a slight tart taste, since strawberries are not very sweet. This entry was posted in Uncategorized and tagged 23 June 2016 Strawberry Juice, Strawberry Juice. Bookmark the permalink. I found your website while trying to solve a corn tortillia problem. It struck me almost speechlesss. Durgan is a name I have never seen on a living person, however it was my GGGrandfathers name. He is a very important man to me. May I ask how you came to be named Durgan? Is it a family name? It was what I was going to name my only child had she been a boy. I think it is such a strong indivual name. Reading these posts with fascination as you seem to be involved in some of the food processing that I do as well. Couple questions though. Why boil the fruit? I believe fresh is always better than cooked but perhaps I am wrong? I live on 1/3 acre in Nanoose Bay on Vancouver Island in Zone 8 and we grow almost every weird edible you could ever imagine. Bumper crop of berries of all sorts this season.